I had my first taste of the new Warriors of Chaos list last night, though I was facing against it with my High Elves. Years ago, my High Elf infantry horde would have really struggled against a chaos army, but now that elves strike first it should make the army concept more viable. In a 2.5k army I fielded 2 blocks of spearmen, 2 blocks of Swordmasters, 2 small units of Silver Helms (using them as "hard" fast cavalry rather than shock troops so no upgrades), 2 small units of shadow warriors, 2 bolt throwers, 2 eagles, 2 characters (a prince and a noble army standard) and 2 mages - both level 2 of course. And just to spoil all that symettry, one unit of archers. The chaos army contained 3 blocks of warriors, one unit of chosen. These lined up roughly opposite my four infantry units. Down my left flank came a unit of knights, while my right flank was threatened by a unit of marauder horsemen and 3 dragon ogres. Taking centre stage was a giant, and there was a hero on a steed, a hero on foot and a sorceror dotted about various units. There was also some meat shields in a unit of marauders and a couple of units of hounds. Sometimes when I design an army list I play out an ideal result in my head. Everything goes according to the theory and the army does exactly as is hoped. 99% of the time the theory goes straight of the window within a turn or two, due to a canny opponent, dice rolls, awkward terrain, whatever. But this game was one of those 1% of games where everything goes exactly as planned. The eagles made it to the rear of the chaos army and slowed it down, allowing the elves to shoot/magic with impunity. The giant was eliminated as a threat early on, mostly due to bolt thrower fire and the Curse of Arrow Attraction spell. The fast and powerful units were slowed/harried by Silver Helms and Shadow warriors, while the archers and bolt throwers removed most of the light/fast units. By turn 4 the chaos army was considerably weakened - the giant was dead, the knights and dragon ogres were ineffective on the flanks, while the central infantry units were doggedly trudging forward under a hail of missiles. By turn 6 the combat started, with the chaos units all considerably weakened while the elf units were still at full strength. The Elven Prince and Noble made short work of the chaos champions, the swordmasters despatched two units of chaos warriors, only the spearmen stumbled against the chosen, but still held their ground. Complete humiliation for the chaos general, a perfectly executed plan by the High Elves. A nice end to a good year of gaming. And a valuable lesson to me as a chaos general in waiting - warriors need lots of support troops to help them butcher the enemy. 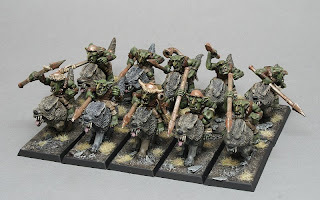 I am thinking that each unit of warriors needs an accompanying unit of hounds to screen them and/or drive away march blockers, maybe a unit of marauders to lend some numbers, and a chariot to help keep cavalry/fast units at bay and add extra punch in combat. These wolf riders have been sitting unpainted on my shelf for about a year, so when we started to try out the loot and pillage scenarios from a recent White Dwarf, it was an ideal excuse to get them painted. They were painted quickly, with very little attention to detail, just a bit of care on the faces. I have a theory that freshly painted models seem to fare pretty badly. It seems to me that as soon as you unfurl your latest painted unit on the battlefield, you can guarantee a swift demise for them. So how did this lot get on? There are actually two units here, both with musicians. One unit failed an animosity test with a 6, resulting in them charging a unit of Empire Greatswords. They were soundly beaten and fled the field of battle. The other unit did better, harrying a unit of Empire Knights, until eventually they were shot to pieces by handgunners and pistoliers. That's probably par for the course for wolf riders, so my theory is unproven as yet. The star turn in the game was a unit of spider riders, who scaled the walls of a watchtower, despite the damage from a well-aimed fireball, then clambered over the top to kill two Helblaster crewmen - the surviving member was so traumatised he ran for his life, flinging himself from the parapets!